The riverside teems with small wildlife. 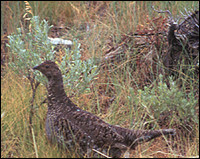 Birds large and small zoomed out of the brush flushed out by the approaching hiker. A small, wily otter with a silver trout in its mouth, scurried triumphantly out of the river and into a hidden den in the riverbank. The critter was not the only angler on the river, as a nattily attired fly fisherman passed us on the trail, the lone human we encountered. Slowly as one follows the lazy river upstream, a few conifers gradually begin to appear on the hillsides flanking the river. After winding through a gate marking the entrance into Medicine Bow-Routt National Forest, the trail rises quickly and follows a ridge affording dramatic views of the river below and the wilderness to the south. The hills of the upper Encampment River are thickly populated with spruce and aspen. A mid-morning, chilly rain charged the air with a strong smell of sage. After rounding the ridge, the trail soon descends into a grove of aspen where signs mark a trail to Purgatory Gulch to the east, and the boundary of the Encampment River Wilderness. Further ahead, the trail and wilderness area beckons to the hardy backpacker. According to the forest service, old mines and cabins may be found along this section of the trail. Portions of the lower Encampment River Trail are marked as a wilderness study area, designated as such because of a proposed timber sale and concerns whether the area is home to lynx, although according to a forest service official, none has been officially identified in some time. While the Encampment River Trail was curiously quiet and uncrowded even in July, there was a time when this area was teeming with fortune hunters. This colorful past is chronicled at the Grand Encampment Museum back in town. 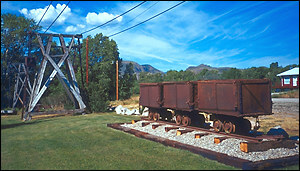 A section of the aerial tram that kept the Encampment smelter supplied with ore. In 1897 and 1898, rich copper and gold strikes sparked a period of intense speculation. Newspapers of the day proclaimed that Encampment, then known as Grand Encampment, would surpass Denver in size. “Has the true El Dorado at last been discovered?” queried the Grand Encampment Herald in April, 1898. A few years later, with mines well established, a 16-mile aerial tram was constructed to carry ore from the Sierra Madres to a smelter outside Grand Encampment. However, a series of setbacks, including a precipitous drop in the price of copper, over-capitalization and questionable stock sales, contributed to the demise of the mines in 1908. The Grand Encampment Museum and surrounding grounds contain several historic buildings and mementos from the area’s mining era, including portions of the tram, and is well worth a visit. Story and photos by David Iler.